I'm sure many people are familiar with Empire Shopping Gallery. 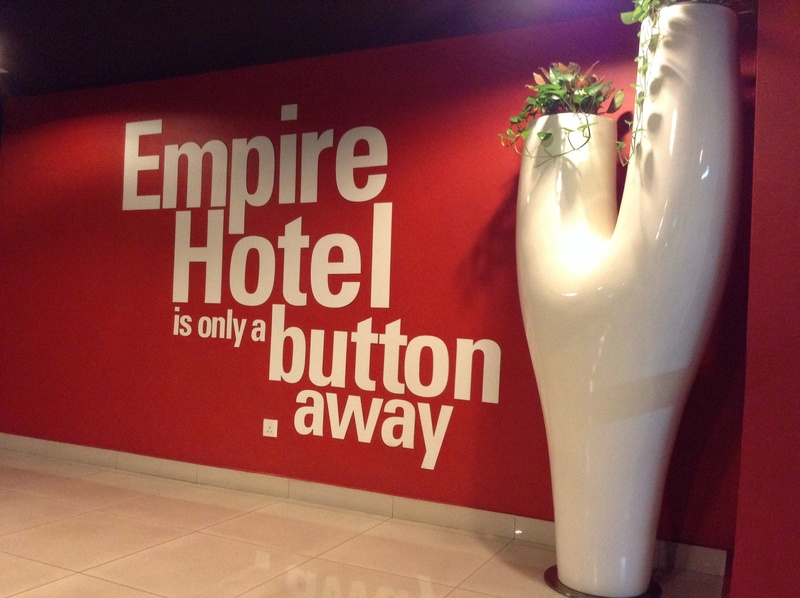 But when it comes toEmpire Hotel, the awareness is not as widespread. I was aware that the hotel existed but never really paid much attention to it until recently. Looking for a place to spend a girls' night out, Empire Hotel was convenient because of its location. It's not too far from our homes, and it was no problem for some of us to access on the way back from our day jobs on the Friday evening we booked at the hotel. The fact that it's surrounded with dining places is an added bonus - we definitely made full use of the mall downstairs for our late night snacking! The hotel entrance is not as obvious as you'd expect. On the ground level, it's right next to the mall entrance where The Loaf and The Coffee Bean are. If you're coming from the basement, you'll have to look for the lift lobby as seen in the photo above. It's in a far corner of the basement carpark. Guests get complimentary parking! We just had to give our parking ticket to the reception counter to validate. 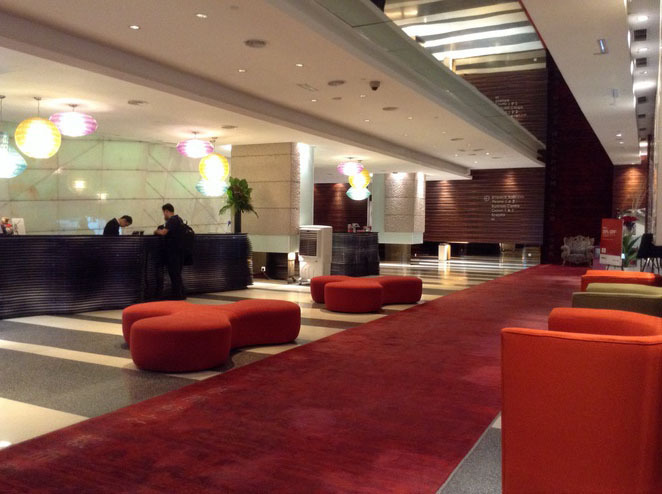 The reception area on Level 2. 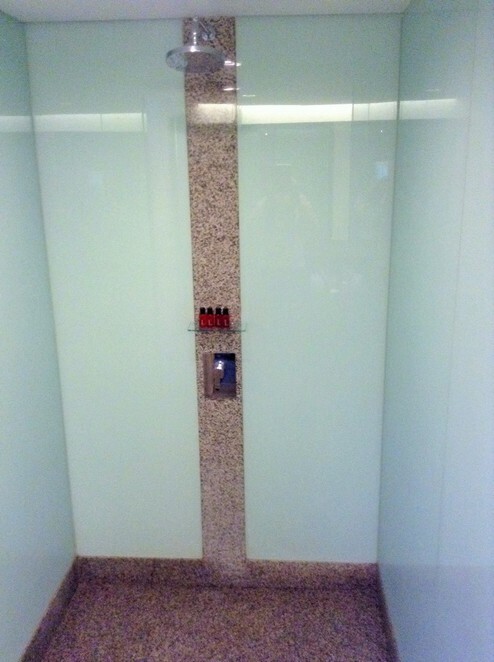 Once you're in the elevator, you'll have to head to Level 2 for the reception area. I was pretty impressed when I got here ... it's wide and spacious, and I love the giant mirror spanning across the ceiling. My friends and I booked through Agoda for this particular stay, and there was some misunderstanding during the booking process - we accidentally missed the option that provides breakfast for four people instead of only two. Breakfast can be added on for an additional RM30 plus per person. Comfortably sized king sized beds. Floor to ceiling windows guarantee a great view. 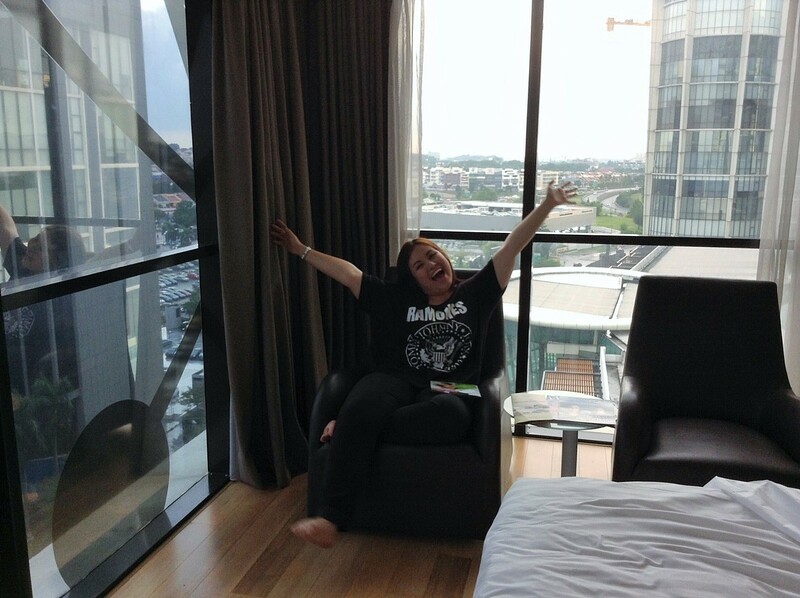 I was perfectly content to have the curtains wide open throughout our stay. The view was wonderful! 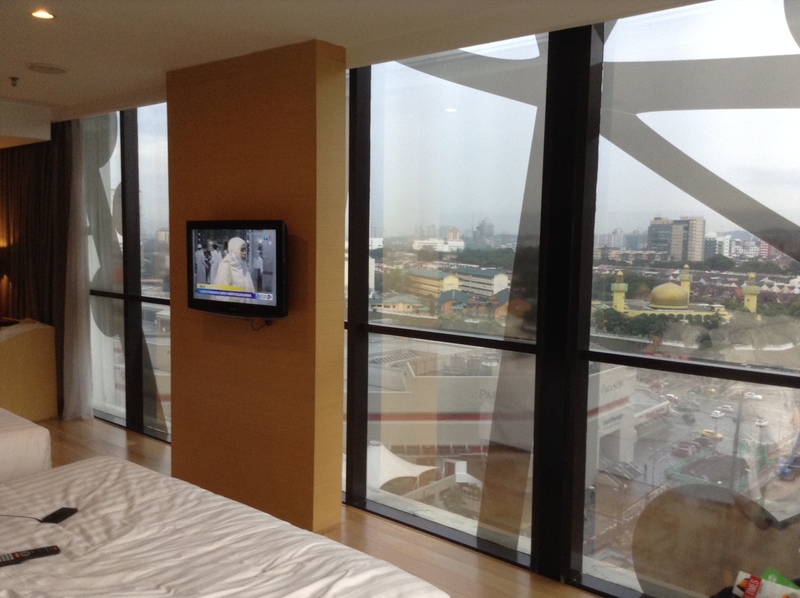 Floor to ceiling windows on two sides of the room give a wide angle view of Subang Jaya. 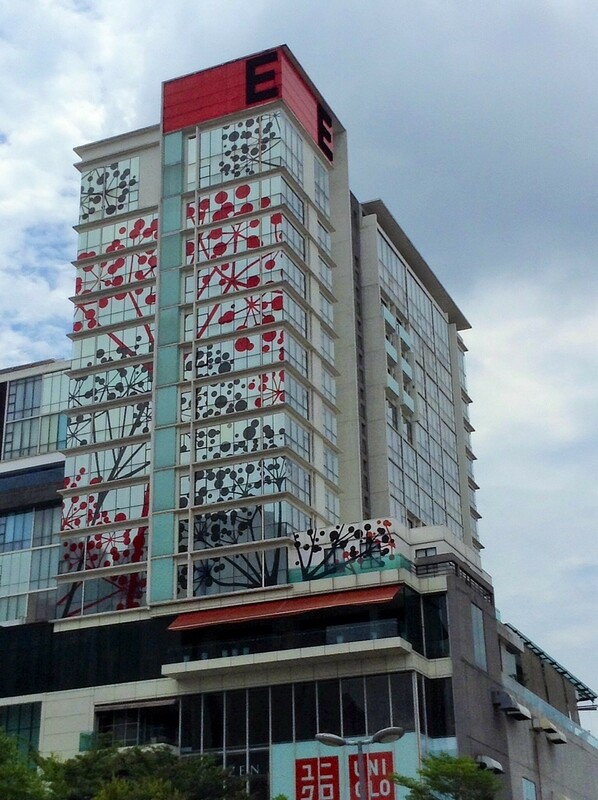 The outer facade is covered in a colourful pattern which stretches across the building, offering guests some privacy from pedestrians on the streets below. We really enjoyed this aspect of the room. It was very pretty at night especially, with all the lights from the building below and in the distance. The two couches at the corner were very strategically located. It makes a really cosy reading spot. If you do want to catch up on any online reading in particular, wi-fi is complimentary for hotel guests. We got a special user login ID and password, based on the name of the person who booked the room. There's also a study table in the room if you need to use a laptop. 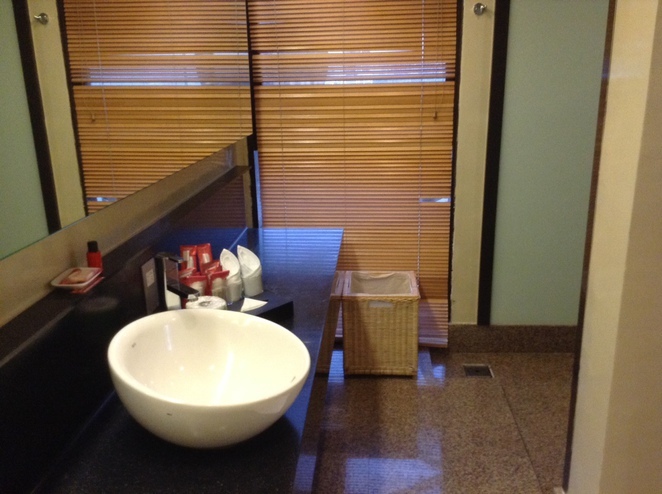 Meanwhile, the bathroom is long and narrow, providing your basic set of hotel offerings: shampoo, toothbrush, lotion, conditioner, etc. There's even a window in here with a view of the street below. Despite the narrow bathroom. the shower is surprisingly spacious. You could fit a tent in there if you tried. There's not a lot of space for shampoo bottles though. I liked the shower gel scent, but the little red bottles are really hard to squeeze. 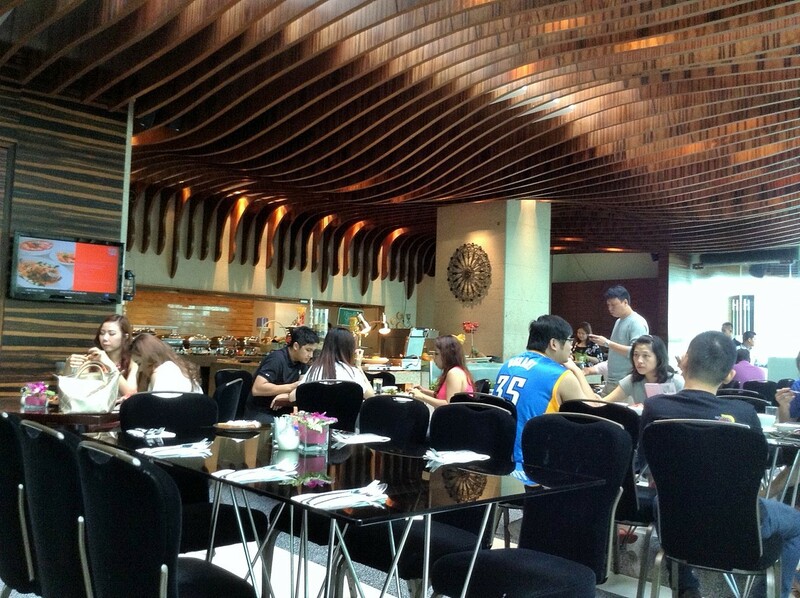 The breakfast buffet was served in Kitchen Art Brasserie, located just opposite the reception on Level 2. We got down kind of late for breakfast, but just in time before they closed the buffet at 10.30 am. They also serve lunch, dinner and hi-tea buffets here as well. A little bit of (almost) everything. We found both Eastern and Western style breakfasts. 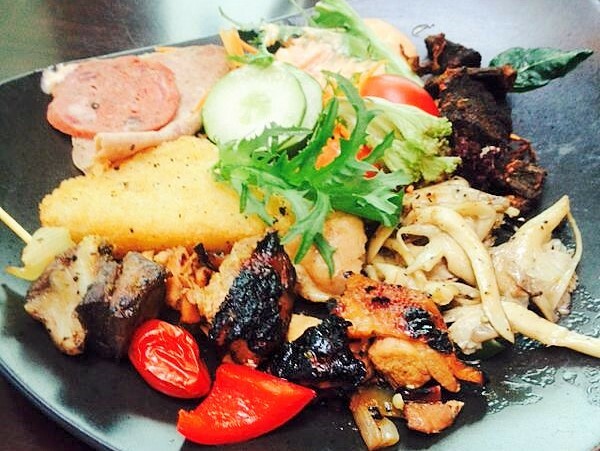 There was an egg station, sausages, sauteed mushrooms and also a nasi lemak and a porridge station. A lot of other things to choose from too. The food was good, no complaints here. Our one night stay was lots of fun, and we really enjoyed the room. Kind of wish we could have stayed an extra day as well. Even though we live just a short drive away, there really is something special about spending the night just above a familiar shopping mall. 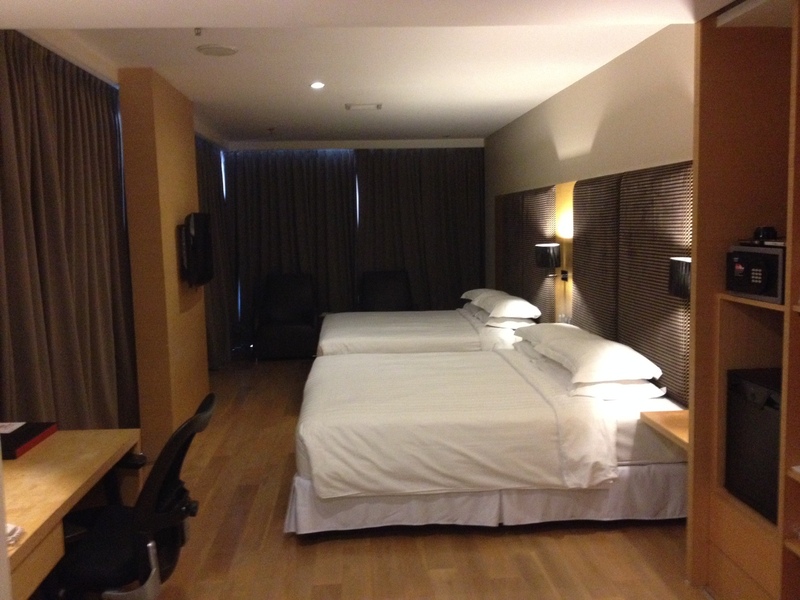 Cost: Premier dualistic was about RM460 a night.